I have to say that if it’s not for my friend Richard over at the Filmstalker who wrote an article about a film adaptation of this book, I would not have heard of this literary existence at all. 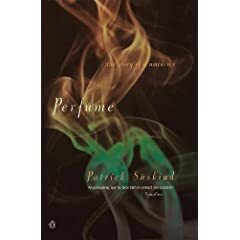 I know and what a shame, but I keep telling myself to widen out with my choices of reading and I have done that this year having read a few of Umberto Eco and recently Gabriel Garcia Marquez; I am so glad that the Perfume has now been added to that list. It was a short read at just under 4 hours being only less than 300 pages. I was advised by a good friend to wait till the film comes out next year but I was getting rather bored and something must stop me from my growing obsession with Daniel Craig! For those of you who have read this book and is dreading how the film version treats our main character, that also crossed my mind, nevertheless I am still torn as to what to feel for Grenouille. It is an amusing and interesting story about the need to belong, that need to be loved, but in this case, realising that its not the be all and end all. I would not want to spoil it for you any longer and I suggest that if you are planning to see the film without reading the book, the story might affect you differently and not as intended. I have not seen the film as it wont be released in the UK until January, but this book is without a doubt a must-read, I have never read a book as original and creative, as disturbing and as sad. It was a best-seller 20 years ago. Now we have Dan Brown. Great change! It´s difficult not to sympathize with Grenouille. The world around him is often repulsive. sheila told me about perfume when i was still in high school. i never got to read the book. now that you’ve told me about it, i’ll start reading… once i have a copy. hehehe. Shang: You’ve got to read it!!! Apparently the film is out in the UK on 26 December! I can’t wait!!! !